This post is sponsored by Mission Avocados. We all know February is the month of love with Valentine’s Day quickly approaching, but did you know that it’s also American Heart Month?! This month we are encouraged to focus on our heart and with cardiovascular disease (heart disease and stroke) being the global leading cause of death, there’s no better reason to learn about heart health benefits of avocados and ways to better protect your ticker. Hint hint: Avocados have lots of heart health benefits. Keeping your heart healthy requires a lifestyle approach with staying active and eating healthy ranking at the top of the list. But other important factors that can’t be ignored are controlling your blood pressure, blood sugar, managing stress and keeping a healthy weight and of course, no smoking! Learn more about heart health here. Aside from not smoking, what’s interesting is if you take care of the first two principles: staying active and eating healthy, they directly impact the other important factors for heart health. 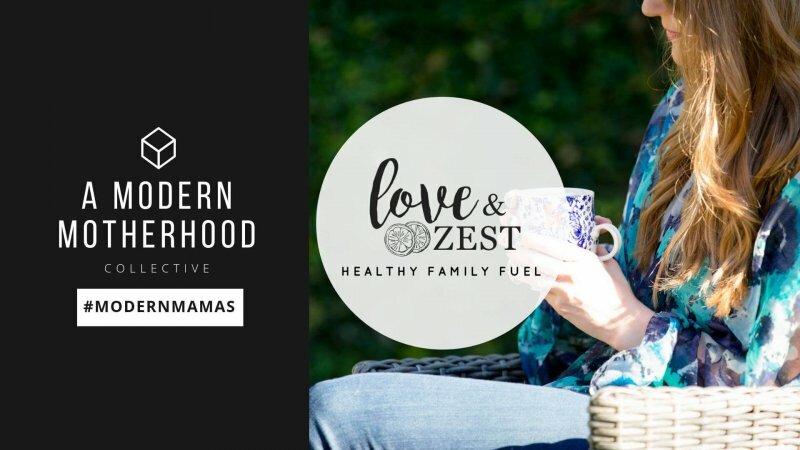 So since this is a food and nutrition blog, let’s focus on the eating well aspect for a healthy heart. When it comes to eating well for your heart, there are 4 things to keep in mind. Fiber. Filling up on greens at meals and making them the base of your diet along with fruits is a great way to boost fiber and antioxidants to help with managing cholesterol and healthy weight. When eating grains, choose whole grains over refined for a bigger fiber boost. We should all aim to get in at least 25 grams of fiber per day and those on higher calorie diets and men should eat even more! The recommendation for most men is 38 grams per day. Fats. Eating the right fats is important for the heart and the heart health benefits of avocados cannot be ignored. Avocados are a nutrient dense food and over 75% of the fats in avocados are good monounsaturated fats; they are also low in saturated fat, cholesterol-free and sodium-free. One-third of a medium avocado has 80 calories and nearly 20 vitamins and minerals, making it a great nutrient dense food choice. Adding avocado to your meals can also help with satiety and keeping a healthy weight. Get more of the right fats in your diet by setting a goal to eat fish twice per week and work to reduce the unhealthy processed and fried fats out of your diet to keep cholesterol at a healthy level. Sugars. Sugar and carbohydrates can be found naturally in fruits, dairy, grains, and some veggies, and there should be no surprise that refined sugar is added to many foods for sweetness. While we should definitely aim to reduce refined and added sugars in the diet, we also need to balance meals and snacks with the right portions of natural sugars (fruits, whole grains and dairy), with adequate proteins and healthy fats to keep blood sugar in check. Cooking at home. As hard as it can be with our busy lifestyle, I think cooking at home is a key principle to a heart healthy diet. Many restaurants skimp on the veggies, cook with unhealthy fats, and ingredients that are less than wholesome. Dining out is also a big contributor of too much salt in the diet which could contribute to high blood pressure in those that are salt sensitive. I have lots of avocado recipes on my site but I’ve been working with Mission Avocados to create these two NEW heart healthy avocado recipes for you guys. You don’t want to miss these because they are like flavor bomb!! 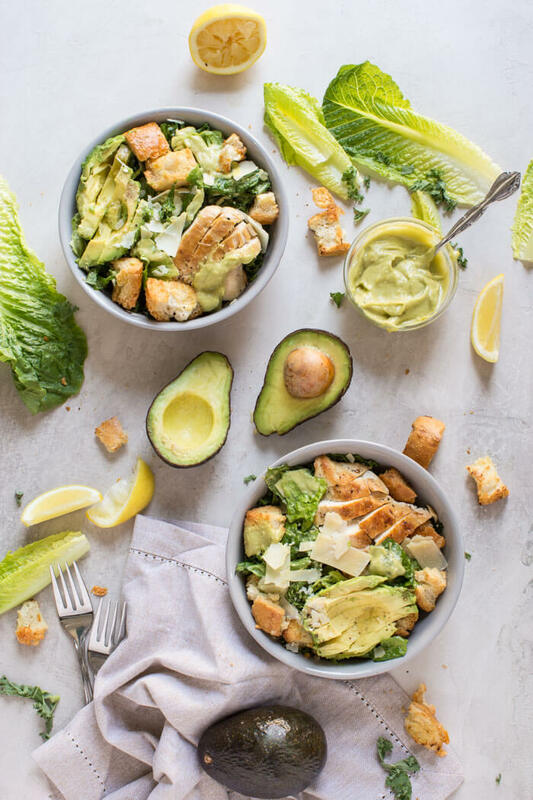 This Avocado Chicken Caesar Salad is made with a simple mayo and egg free dressing thanks to creamy AVOCADOS… made right in the blender! It’s easy to get in all those heart health benefits of avocados with this easy lunch or weeknight recipe. 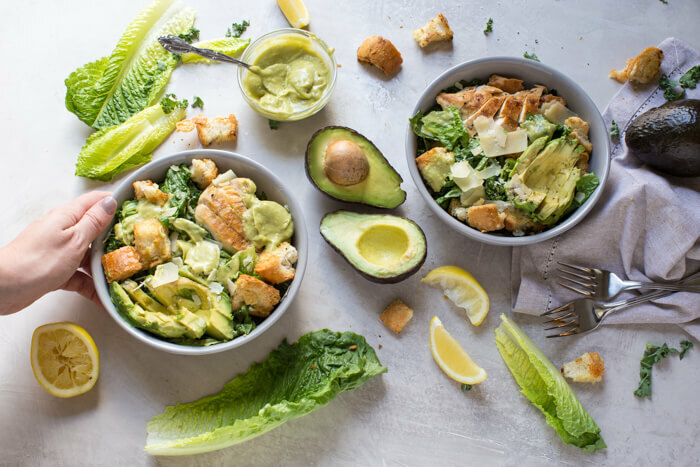 Get the recipe for this Avocado Chicken Caesar Salad. 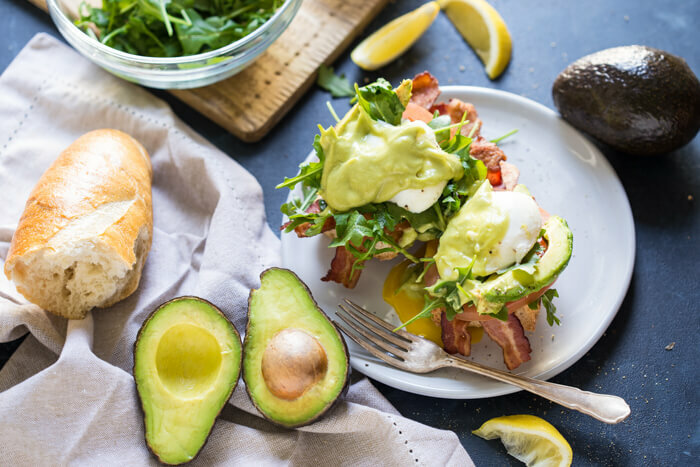 Eggs Benedict BLT with Avocado Hollandaise, a hearty comforting breakfast recipe that’s packed with nutrition thanks to avocados. You’ve gotta try this Avocado Hollandaise made with avocado, lemon juice, olive oil and cayenne pepper. It’s crazy simple to toss together into a creamy perfection– no eggs, butter or double boiler required. 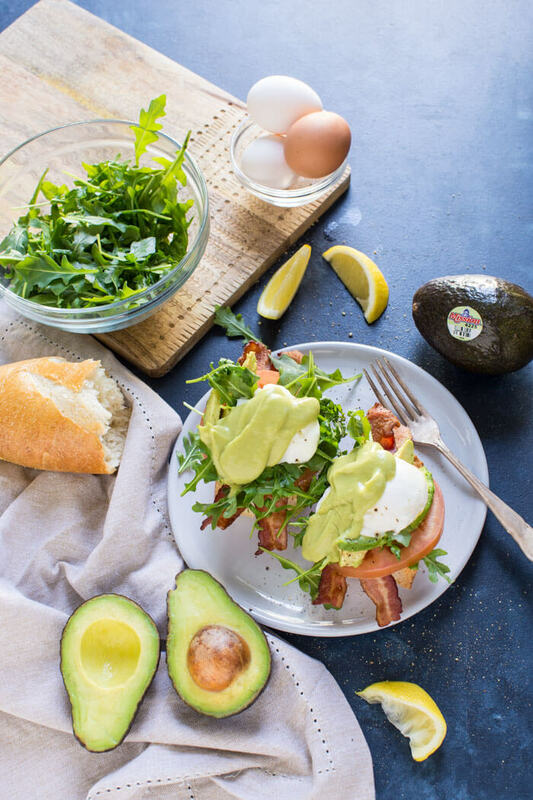 Snag the recipe for this Eggs Benedict BLT with Avocado Hollandaise. Avocados received American Heart Association certification! 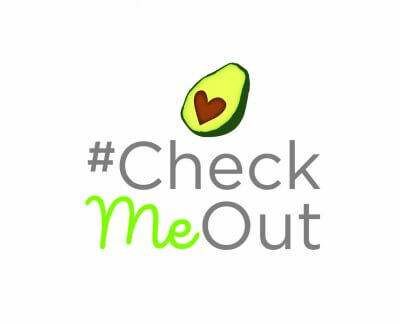 Mission Avocados have reason to show off this February…they’re sporting some new ink in the form of the American Heart Association Heart-Check Mark announcing to consumers to #CheckMeOut. The American Heart Association Heart-Check Food Certification Program uses the Heart-Check mark to make it easy for consumers to spot heart-healthy foods in the grocery store or when dining out because avocados recently earned this prestigious certification. So now that you have the DL on the heart health benefits of avocados… I’d love to know, what’s your favorite way to add avocado into your daily routine? Hit reply to this email or leave a comment below. After 22 years in New Mexico, my husband and I moved to south Texas (McAllen) just a stone’s throw (literally) from Mexico. One of the positives in this difficult mood is the abundance of produce and year ’round avocados. We love them! They really are healthy, and we eat them regularly… Thanks for getting the word out! Oh that’s gotta be a big bonus!! I be the avocados are so crazy fresh. I love learning more about the heart health benefits of avocados! My favorite way to incorporate more avocados into my day is to add half of one to a smoothie for a creamy texture! I’m a big fan of avocados! So delicious! 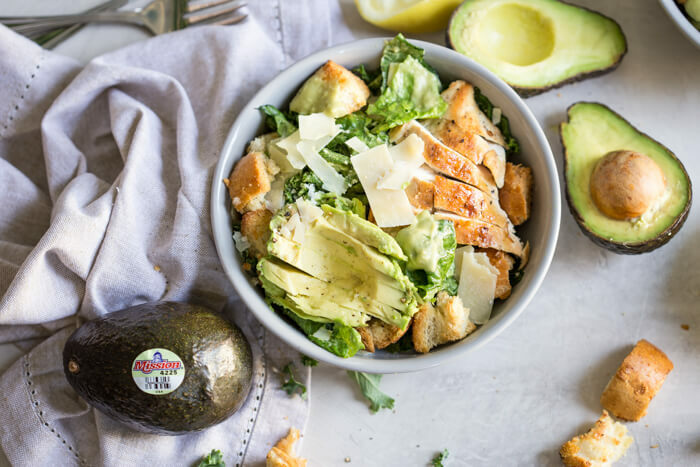 That avocado chicken Caesar salad is perfect for dinner! Great tips for heart-healthy eating! I love avocados and their health benefits. The recipes look delicious! As a kid, I couldn’t stand avocados, but now I can’t live without them! They’re such an amazing fruit for dairy substitutions. I agree on eating in. Even when I don’t have time to make great dinners, it’s still healthier than eating out. Avocados are hands down my favorite food! Such great nutrition but even better taste! This bowl looks beautiful! I love avocados! 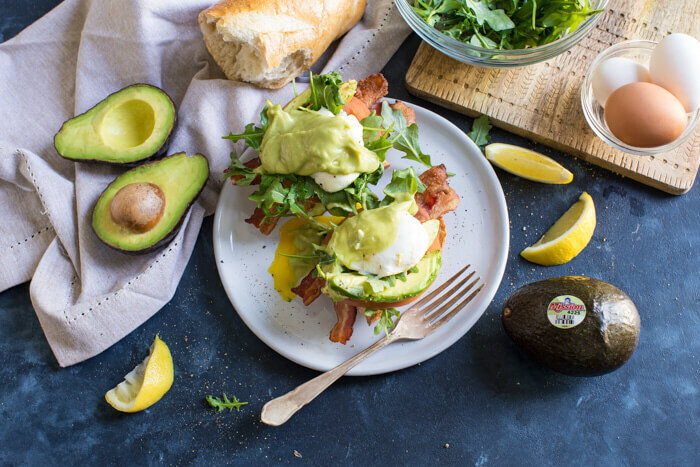 That Eggs Benedict BLT with Avocado Hollandaise looks seriously to die for!! I’m obsessed with avocados. Soooo many health benefits and love the healthy fats. I’m from California, so we pretty much add them to everything! Haha. Love avocados!! And that sauce looks amazing!! I eat avocados every chance I get. I love them on top of a frittata for breakfast, a salad for lunch, and made into guac for dinner. Such great healthy fats! Avocados were on sale today at Kroger, 2/1 so I picked up a bunch. Love them and your salad is making me drool. I can legit eat avocados for every meal! Can’t believe I used to hate them growing up!! !